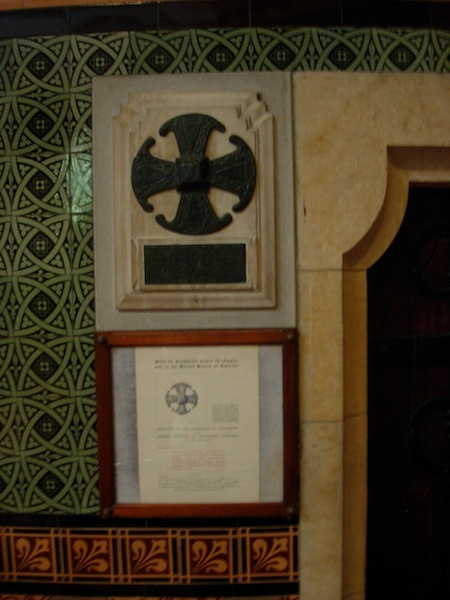 Image of a copy of a ninth-century cross in St Paul’s Anglican Cathedral, Melbourne, Victoria. 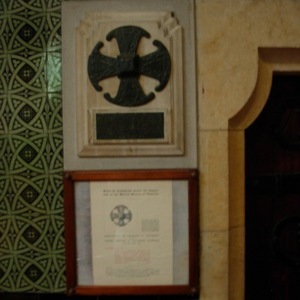 The cross is on a stone plaque and is an enlarged copy of the Anglo-Saxon cross found at Canterbury in England in 1867. The original cross was on an Anglo-Saxon brooch. A number of stone versions of the cross were sent by Canterbury Cathedral to Anglican diocese cathedrals in 1932. “Canterbury Cross, St Paul’s Cathedral, Melbourne, Victoria,” Medievalism in Australian Cultural Memory, accessed April 23, 2019, http://ausmed.arts.uwa.edu.au/items/show/1305.